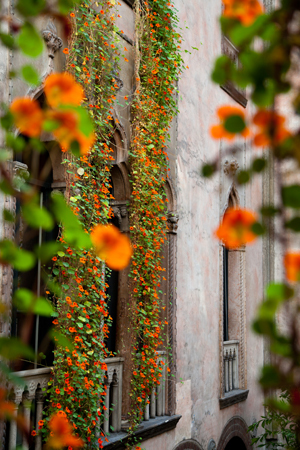 Just a quick heads up about the Hanging Nasturtiums exhibit at the Isabella Stewart Gardner museum. This is an annual celebration of Isabella’s birthday, which is April 14, and started in 1904 shortly after the museum opened in the Fenway area of the Back Bay in Boston. Nasturtiums were her favorite flower. I went to the exhibit yesterday, Thursday, April 4th, and it was well worth the trip. 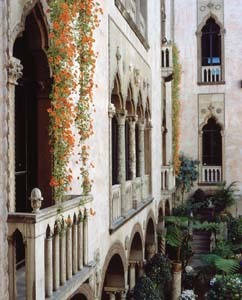 On three sides of the Italianate Courtyard, orange nasturtium vines hang from the third floor balconies and complement beautifully the flowers that adorn the ground floor garden below including: purple hyacinths, yellow daffodils, dark blue cineraria, orange-and-lemon flowered Clivia miniata, and pale yellow azaleas. 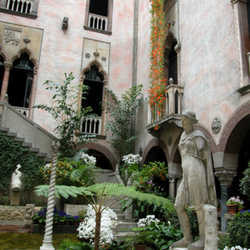 Sunlight filtering through the glass roof also highlights the lush green foliage of the other tropical plants and trees of the courtyard as well as Greek statuary. It’s a sight to behold. The museum, meant to emulate an Italian palazzo, was built to Isabella’s specifications and houses the extensive collection of fine art and antiques that she and her late husband Jack collected in the latter half of the 19th century on their extensive travels to Europe and Asia. All of the collections were placed in the rooms of the museum by Isabella personally; she stipulated in her will that everything remain exactly as she had arranged them. For a description and overview of the museum, see the Public Gardens section of this website. When I spoke with the museum employees, they said the exhibit would go to about the middle of April or when the flowers expire. It may be gone by the end of next week. So don’t delay! If you can’t make it this year, make a note on your calendar to see it next year. Also, no photography is allowed.